In order to test for weak form efficiency in the market a vast pool of individual stocks must be analyzed rather than a stock market index. 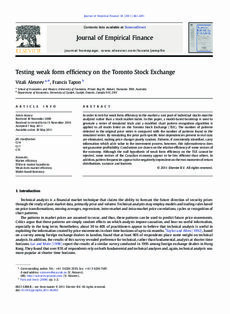 In this paper, a model-based bootstrap is used to generate a series of simulated trials and a modified chart pattern recognition algorithm is applied to all stocks listed on the Toronto Stock Exchange (TSX). The number of patterns detected in the original price series is compared with the number of patterns found in the simulated series. By simulating the price path specific time dependencies present in real data are eliminated, making price changes purely random. Patterns, if consistently identified, carry information which adds value to the investment process, however, this informativeness does not guarantee profitability. Conclusions are drawn on the relative efficiency of some sectors of the economy. Although the null hypothesis of weak form efficiency on the TSX cannot be rejected, some sectors of the Canadian economy appear to be less efficient than others. In addition, pattern frequencies appear to be negatively dependent on the two moments of return distributions, variance and kurtosis.